In his November 9, 2011 Rolling Stone article, "How the GOP Became the Party of the Rich," Tim Dickinson gives a blow-by-blow account of how the GOP transformed from a fiscally conservative party into the great benefactor of the rich at the expense of the rest of us. It is a damning story liberally annotated with quotes of old-time Republicans who are aghast that the modern Republican Party has become the tool of the wealthy. Republican tax-related policies have hollowed out the middle-class transferring trillions of dollars of wealth from the middle-class and poor to the already wealthy, a fact that has belatedly begun to dawn upon the American public and supplies juice to the Occupy Wall Street movement. The results of our 30-year experiment with trickle-down economics are in. Fail. As Dickinson points out trickle-down turned out to be gusher-up. 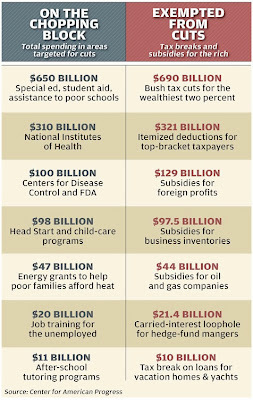 The table illustrates the Republicans' ideas of what programs should be on the deficit reduction table and which subsidies for the rich should be exempt. Compare corresponding entries in the two columns. 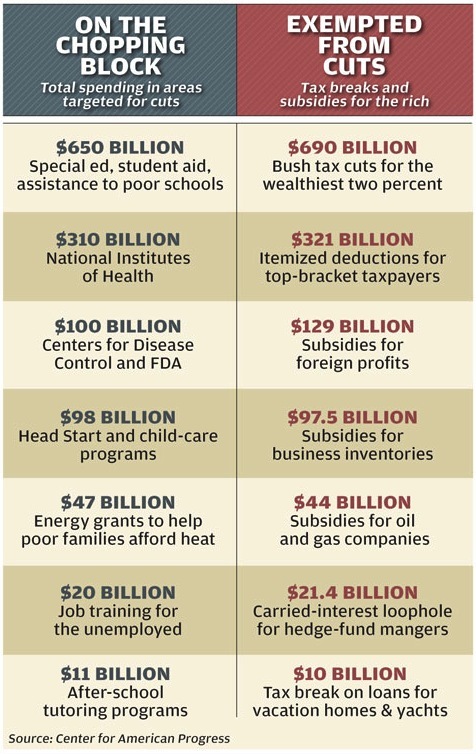 Decide for yourself which is more important, cutting the National Institutes of Health budget or keeping unlimited itemized deductions for top-bracket taxpayers, eliminating energy grants that help poor families afford heat or continuing subsidies for oil and gas companies. Note that you would have to not just cut, but zero-out the entire budgets of the agencies and programs to roughly match the direct loss of revenues due to the corresponding tax breaks and subsidies for corporations and the rich. To be sure the Republican tax war on the non-rich has paid off handsomely for the super-rich and their pandering political lackeys. Panderbear prays the advent of OWS, informed by the historical fact of wealth redistribution upward and accelerating income divergence, signals the beginning of the end for party of the rich economic policies that unfairly tilt the playing field in favor of the rich and are killing the American Dream. How much of the tax burden should the wealthy share? This question, which could be considered the main crux of the recent spate of protests, is handled by both Presidents Ronald Reagan and Barack Obama in two separate speeches, separated by 26 years. Considering the high level of nostalgic regard that modern conservatives have for Reagan and their disdain for any mention of raising taxes on the wealthy, one would think that Reagan's views would match the current conservative position on this topic and be diametrically opposed to Obama's. Thanks for your excellent comment and the link. It's spooky how similar President Reagan's and President Obama's comments are on the question of the proper distribution of the tax burden. It's scary how far Republicans have strayed from the views of their idol, Ronald Reagan. You're more than welcome to link to that video on any of your posts. After reading that article, I wanted to find the actual video of Reagan saying those statements, just to know for my own self that it really did happen. Then I did some research on my own to see what Obama had to say, not really looking to see if they necessarily matched up. After sitting through both speeches, it amazed me that they locked up so well. Of course, this kind of work is never really done by average Joe American or a lot of the politicians out there. They know how to repeat talking points without any true thought about what it is they're parroting, in the hopes of garnering votes by preying on the fears of equally uneducated American voters. I enjoy your blog. Nice to see some thought put into digesting the information that is being given to us instead of reacting to factual evidence as having a bias. The implicit, if not explicit, message in most of my posts is that people must do their own research, check the facts, and use their own rational thought processes to forge informed opinions as you have done or they will forever be victims of confirmation bias and pandering politicians.